(CNN) -- Bottled water is often touted as pure and healthy, but it may not be safer than ordinary tap water, according to study of bottled water samples by an environmental advocacy group. The Natural Resources Defense Council (NRDC) tested more than 1,000 bottles of 103 different brands of bottled water from bought in California, Florida, Illinois, New York, Texas and the District of Columbia. Most waters were high quality, but about one-third of the brands tested had at least one sample that was contaminated with high levels of pollutants that exceeded levels allowed by California or bottled water industry standards or guidelines. California has the highest set of standards for bottled water, the NRDC says. The Food and Drug administration regulates bottled water on a federal level, but waters bottled and sold within the same state (about 60 to 70 percent of all bottled water) are exempt and regulated by state authorities. Tap water is regulated by the Environmental Protection Agency which has stricter requirements for water including disinfection and testing for parasites such as giardia. "Bottled water is essentially regulated on the honor system in most states," said Eric Olson, one of the authors of the report. "Unlike tap water suppliers, bottlers need not disclose to consumers known contaminants in their products." The International Bottled Water Association, whose members manufacture 85 percent of bottled water sold in the United States, stressed that the NRDC reported a majority of bottled water was "of good quality." IBWA said during the past 37 years under the FDA's regulations, there have been "no confirmed reports" of illness related to bottled water in the United States. NRDC's report recommends nationwide federal review for bottled water and a penny-a-bottle fee to fund bottled water regulation. The findings comes as Sen. Frank Lautenberg (D-New Jersey) plans on introducing legislation to Congress requiring the same standards for chemical and bacterial contamination as tap water and more detailed labeling for bottled water. "There may be bottled water that's cleaner than tap water and some that's dirtier, but now there's no way for consumers to tell the difference," Lautenberg said. The purity of bottled water has also been criticized for a mineral it's lacking -- fluoride. Few bottled waters contain the fluoride levels found in municipal water supplies. The mineral, credited with preventing cavities in children and adults, is added to nearly 60 percent of the nation's public water supply. The American Dental Association reports the mineral prevents between 40 and 60 percent of cavities in people who live in communities with fluorinated tap water. Americans drink an estimated 3.4 billion gallons of bottled water, often sold as distilled water, spring water or mineral water, each year. Consumption has been increasing about 10 percent a year, the industry says. The market is dominated by smaller producers but large companies are taking bottled water's popularity seriously. Coca-Cola Co. announced in February it will start selling a line of mineral-enhanced bottled water during the next year. SAN FRANCISCO -- If it's absolute purity they want, consumers of bottled drinking water will be dismayed by the test results released Tuesday by a national environmental organization. But if government drinking water standards are good enough, they'll be heartened to learn the vast majority of samples from the 103 brands surveyed by the Natural Resources Defense Council are within a safe range. The council nonetheless said it found enough impurities to petition the federal government for more stringent testing and quality standards for bottled water, which is regulated by the U.S. Food and Drug Administration and the state Department of Health Services. As part of a two-pronged strategy for stricter regulation, the Environmental Law Foundation of Oakland filed a lawsuit Tuesday to stop eight bottlers from selling or advertising in California unless they post consumer warnings on their product labels about the presence of harmful chemicals. The lawsuit, which is based on the NRDC's test findings, accuses the companies of engaging in unfair business practices, violating state health and safety rules and making false advertising claims about the purity of their water. The lawsuit is about truth in labeling, said James Wheaton, the lead attorney who filed the complaint Monday in San Francisco County Superior Court. "Just because it's in a bottle, doesn't mean it's better," Wheaton said at a press conference held with the NRDC in San Francisco. The water bottlers named in the suit are major producers: Crystal Geyser Water Co. of Calistoga; McKesson Water Products Co. of Pasadena, producers of Alhambra and Sparkletts; Safeway Inc.; Lucky Stores Inc.; Ralphs Grocery Co. of Compton; Vittel Inc., a division of Perrier Group of America, in Stamford, Conn.; Volvic, produced by Resurrection Enterprises of Santa Cruz; and Apollinaris, a German import. Industry representatives vigorously denied the allegations and berated NRDC for putting an alarmist spin on its test results. "NRDC is trying to scare consumers with its report on bottled water, when the NRDC's own testing shows that bottled water is safe," said Bruce Hayes, spokesman for the International Bottled Water Association of Alexandria, Va., which represents producers of most bottled water sold in the United States. Nearly a third of all Americans drink bottled water, and nearly a third of them are Californians. Since 1982, sales have quadrupled to $4.3 billion a year, industry marketing data shows. The NRDC contends that the industry needs closer scrutiny with so many consumers spending from 240 to more than 10,000 times more per gallon for bottled water than for tap water. "This sales bonanza has been fueled by ubiquitous ads picturing towering mountains, pristine glaciers and crystal-clear springs nestled in untouched forests yielding absolutely pure water," begins the 209-page NRDC report. To put the marketing image to the test, the environmental group said it conducted a four-year study of the bottled water industry, including tests by independent commercial and academic laboratories of bottled water sold in California, Florida, Illinois, New York and Texas. The NRDC tests found byproducts of chlorination that are common in tap water and levels of naturally occurring arsenic and bacteria in 55 percent of the samples from the 103 brands surveyed. Only 4 percent violated federal health standards for bottled water, which the group contends are too lax and in some cases less stringent than those set for tap water. The NRDC petitioned the U.S. Food and Drug Administration on Tuesday to establish the toughest water quality standards possible for the industry. They also want a requirement that water bottlers list on their labels "any contaminants of potential concern" and other consumer information. The petition comes as the FDA is changing bottled water rules to make sure they are "no less protective of the public health" than the U.S. Environmental Protection Agency standards for treatment of tap water. The lawsuit contends that Crystal Geyser, Vittel, Volvic and Apollinaris should have consumer warnings on their lables based on the levels of arsenic found in the NRDC samples. Chronic ingestion of arsenic, a naturally occurring mineral, is known to cause bladder, lung and skin cancer. However, the levels of arsenic were within government health limits. Officials with Crystal Geyser of Calistoga denied the accusations in the lawsuit and called them "unnecessarily alarming." They also contended that NRDC has "inconsistencies in their testing, and other problems." The suit targets Ralphs Private Selection Drinking Water and Lucky's seltzer and Lady Lee purified water and drinking water for exceeding federal standards for trihalomethanes,byproducts of chlorine disinfection processes at treatment plants that studies have linked to miscarriages. James Waddel, acting chief of the state health services' food-safety section, said the standard is not enforceable because it is not health-based but rather set to satisfy industry's desire to achieve better water quality. "There just isn't a public health issue at the levels found by NRDC," he said. The lawsuit accuses Safeway of taking it's "spring" water from municipal water supplies, but a company representative called the allegation "false." "Our spring water comes from a source in Northern California. An Auburn company ships it to us, and we know it is certified as spring water," said Debra Lambert, spokeswoman for the supermarket chains' national headquarters in Pleasanton. Bottled water, whose surging sales have been driven by a consumer thirst for purity, sometimes contains contaminants and is not necessarily cleaner or safer than tap water, according to a four-year study made public Tuesday by a national environmental group. Testing 103 brands of bottled water, the Natural Resources Defense Council found that samples from one-third of the brands contained chemical or bacterial contamination exceeding industry or government guidelines. While the study concluded "that most bottled water apparently is of good quality," it maintains that many brands don't match their pristine claims. 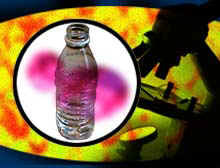 Bottled water "is of spotty quality," said Dr. Gina Solomon, senior scientist with the Natural Resources Defense Council. "People are not always getting the purity they've paid for." In conjunction with the study, the Environmental Law Foundation announced the filing of a lawsuit in San Francisco against eight bottled water companies doing business in California, accusing them of violating the state's false advertising and health and safety laws. "It's not an acute health hazard that's the issue," said Laura McKinney of the law foundation. "The issue is these companies are claiming to be pristine and clean and natural, and they are violating standards in California and are profiting. This is an industry that needs to live up to its advertisements and statements." Industry representatives quickly defended their product, saying there have been no confirmed reports in the United States of illness or disease linked to bottled water. "Bottled water is extremely safe," said Cindy Yablonski of the International Bottled Water Assn. Yablonski, whose organization represents companies that produce 85% of the bottled water sold in the United States, faulted the report for holding bottled water to a variety of industry and government standards, when, in fact, bottlers do meet existing federal regulations. "We believe they are very strict, adequate for the industry," she said. The Natural Resources Defense Council strongly disagreed Tuesday, calling for a strengthening of federal bottled water standards, which are overseen by the Food and Drug Administration and are not as tough as federal regulations governing public tap water supplies. The environmental group concluded that most of the water tested was relatively free of contamination and "therefore generally doesn't pose a health threat to healthy people." But the organization also warned that the presence of certain types of bacteria in some samples might pose problems for vulnerable populations, including infants, the frail elderly and those with HIV and AIDS. After a brief scare in 1990 when samples of Perrier were found to contain benzene, sales of bottled water exploded, driven by consumers who either dislike the taste of tap water or have concerns about contamination of public drinking water supplies. In recent years, tap water, which is more tightly regulated than bottled water by the federal government, has been found in some cities to contain contaminants. With its large, often health-conscious population, California is a leading market for bottled water, with state residents consuming more than one-fourth of the nation's total of more than 3.2 billon gallons a year, according to industry statistics. In 1987, Californians purchased 486 million gallons of bottled water; in 1997, state consumption had leaped to 893 million gallons. However, the lawsuit alleges, some companies selling bottled water are breaking state law, which includes the toughest bottled water regulations in the nation. * That Crystal Geyser, Vittel, Volvic and Apollinaris should carry Proposition 65 warnings that some lines of their bottled water contain arsenic levels exceeding 5 parts per billion. Arsenic, a carcinogen, occurs naturally in soil, and federal drinking water standards permit up to 50 ppb. All the samples cited in the lawsuit contained less than that amount. But the suit contends that bottled water, as a consumer product, is subject to the state's stricter Proposition 65 warning provision. * That Crystal Geyser, Safeway, Vittel, Volvic and Apollinaris are "falsely or deceptively" representing the "purity, wholesome[ness] and healthfulness of their bottled water products" when some samples actually contained levels of contaminants exceeding state bottled water or Proposition 65 standards. * That Safeway's drinking, purified and spring water and Alhambra's mountain spring water contain levels of heterotrophic bacteria that exceed state and industry standards. * That Lucky, Ralphs and Safeway brands of bottled water contain levels of chlorine byproducts exceeding state bottled water standards. * That Safeway's "spring water" appears to be derived from a public water supply. Safeway Inc. representative Debra Lambert categorically denied the latter assertion. "Absolutely false," she said. "It is from a certified spring." She also denied that the company engaged in unfair or misleading business practices. "We go to great lengths to ensure the integrity of products," she said. Lucky declined to comment, saying that it had not seen the suit. Crystal Geyser said the suit "was unnecessarily alarming to consumers." "For the record," the company said in a statement, "we believe we are in full compliance with Proposition 65 and all other state and federal regulations, and certainly are not engaged in any unfair business practices." Yablonski, of the bottled water association, dismissed any concerns about heterotrophic bacteria, saying "it's safe, natural, of no health concern." The products listed below contain the carcinogen arsenic at levels exceeding five parts per billion, the California standard.